Good motivational speakers can excite and inspire their audience to a fever pitch. The euphoric event can seem like a life changing event while it’s taking place. But one of the criticisms of these gurus of hope and positive messages is that after you leave the seminar the revelations start to fade. Some say that after a few days most of the ideas are forgotten. 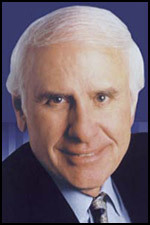 This isn’t the case with Jim Rohn.